Here are 3 free Windows 8 Task Manager apps that let you create a list of your to-do tasks and manage them easily. These task manager apps are useful in organising your important tasks and keep you notified, so that you don’t forget them. You can create multiple task lists, categorize and prioritize tasks, and also set reminders. These task manager apps not only display the list of tasks to be accomplished, but also those which have exceeded their due date. This way, you are able to keep a track of all you important tasks. If you work on your Windows 8 PC, you can take advantage of these task manager apps to manage your tasks effectively, thereby increasing your productivity. The free task manager apps that we are going to review today are Free Task Manager, Get It Done Tasks, and TopPriority. These apps are freely available under Productivity category of Windows Store. With the help of these task manager apps, you can create and manage your task lists and to-dos effectively. Let’s have a look at these task manager apps in detail. Free Task Manager is a free Windows 8 task manager app that lets you create your task lists and get notifications easily. 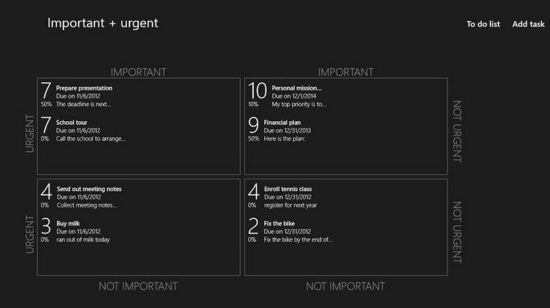 With this free Windows 8 task manager app, you can keep track of your important tasks and to-dos. The app is easy to use and has a simple interface. You can create your own categories to organise various tasks. The app also allows you to tag your important tasks. You can create tasks with or without time constraints. The app also offers to prioritize your important tasks so that they are labelled and appear on the top of your list. Click here to checkout Free Task Manager. Click here to get Free Task Manager. 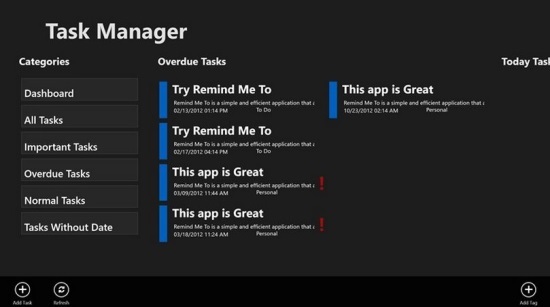 Get It Done Tasks is a free Windows 8 task manager app to help you manage your tasks and projects effectively. With this free Windows 8 app, you can keep track of the tasks to be accomplished and the ones which have exceeded their deadline. You can either login directly, or through a registered account to enter the app’s main screen. 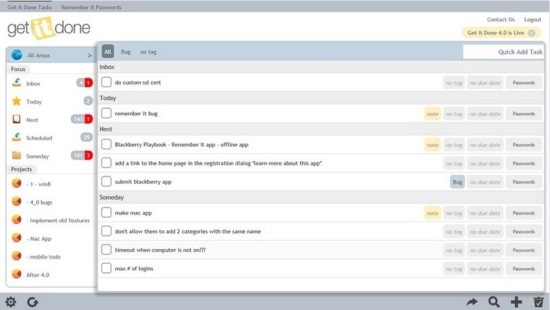 You can add tags or categories to your tasks and easily filter your task lists according to them. The easy-to use dashboard helps to quickly access any options given in the app. Click here to checkout Get It Done Tasks. Click here to get Get It Done Tasks. TopPriority is another free Windows 8 task manager app that manage tasks on the basis of two parameters: importance and urgency. On the basis of these two parameters, the app lets you categorize and prioritise your tasks into four categories. These are: Urgent and Important, Urgent and Not Important, Not Urgent and Important, and Not Urgent and Not Important. The app displays these categories as four quadrants. You can add, edit, and delete tasks once they are finished. You can also prioritize your tasks on a 10-pointer scale. To make it even more organized, the app provides 3 categories for you to put your tasks in – Personal, Work, and Family. You can choose to put a particular task under any of these categories. The app also offers to save the data of all your tasks directly into your SkyDrive, so that you can access it from anywhere. You can also share your important tasks via e-mail using the Windows 8 Share charm. Click here to get TopPriority. These were some useful free Windows 8 Task Manager apps we have found. Give them a try and pick the one that suits you best. Do share your feedback via comments.